Here are some things I am swooning over in this new year of 2012. What sort of things are you inspired by at this moment? I love fonts! Especially free fonts. Some lovely words to live by in 2012. Photo a day challenge?! Yes please. Brilliant. Genius. I want to do it. Love each of those items you posted and the birthday invite is so cool! I will definitely be making invites with balloons one day! Adore your inspiring posts. Keep 'em coming. :) Happy New Year! Oh, I adore the balloon invitations! Thanks for including my stamps in your list of swoons! I'd LOVE to see your photo a day challenge. I bet it will be great! Those balloon invites are so clever! I would love to do something like that for my daughter's birthday party coming up. Love your finds! I am doing that photo challenge too and having a link up where everyone can share their photos! Link up at the end of the month if you want to share your pics! Such great inspiration! 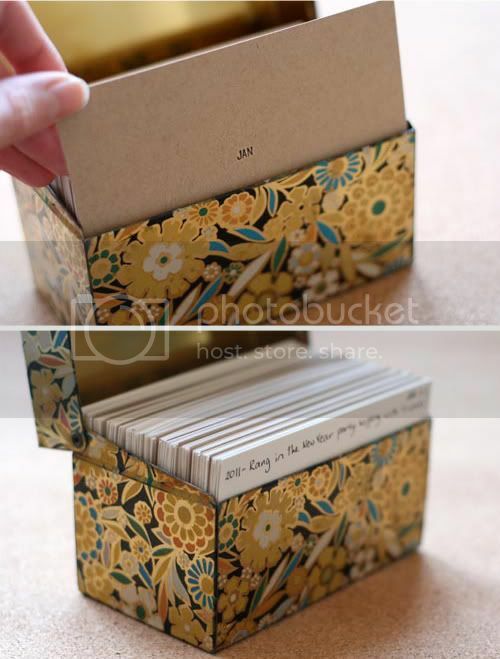 I made a similar calendar journal with index cards and cute dividers. I keep it in a berry container. :) I LOVE THOSE balloons! I'll be 30 next month so this may have to be done..... :) Happy New Year! I cannot agree more with that photographer statement! I have a nice camera, also, but I am not a photographer! It drives me crazy when people start a photography business after buying a nice camera..
Hi Danni, your photographer statement is so-so-so true! Just because someone has the big camera doesn't mean he/she makes the big pictures (neither the other way round). btw - happy new year! What am I inspired by? You! And your blog and posts on pretty packaging!! I stumbled upon your blog a few times before, but when I found you again last weekend, I seriously spent hours reading through posts and looking at your pretty photos! I'm working on a packaging re-design with my jewelry and have been so inspired by the wonderful ways you package your items! Thanks for the inspiration! Love the Only Kiss quote and the tattoo (makes me want another even more). I'm also currently attempting the photo a day challenge on instagram, love it. I love that those words to live by! And the balloon invitation is so creative! Thank you for the tip about the free fonts, just what I needed! I too am so inspired by you! I went to one of your trunk shows for Ruche and fell in love with all your items you had :). I love your blog and your cute shop so much and you will definitely be getting some orders from me. I have had a small business and would love to start buying some of your things for packaging to use :). Thanks so much for the inspiration and ideas! Also love the balloon idea, we used that for our wedding 'save the dates' :D Got some great feedback. Sweet! I love the fonts and can't wait to play around with them this evening. I am also so on board with the photo-a-day challenge and I think I will finish this too! Thanks for sharing! i love finding new fonts!! this post was full of so much greatness and exciting inspiration.